Remember when “it just works” was the Apple mantra? Why doesn’t Apple just offer free unlimited mirrored storage with the sale of an ultra-premium device? Who wants to think about how much storage is in their iCloud? The iPhone is the most expensive and most premium phone you can buy. Why is Apple, a company now worth over $1 trillion in market cap, nickel and diming customers with a $1 a month payment plan so that we can get emails and backup our $1000 iPhone? It’s a bad user experience. Remember back when user experience mattered most to Apple? I too remember those days AND when this stuff just worked, had no strings was free! I had Mac.com Mail the second it was made available. And I even used it for business and although I was ridiculed, I was proud of it. It was the “Grand and Glorious Forthright Apple”. And since they didn’t have a MailClient you had to find your own. I had Office on my machine, therefor I use Entourage and still do, cuz it still works even in 10.12. I have Office 2011 & 2014, it’s just too much of a pain to migrate. But I’m in this place because Apple put me here. They didn’t have a MailClient. Then they decide to release their own client that was horrible. So no one used it, then because of that they change their operating parameters that start locking out third party clients. Well needless to say, although they won’t admit it, due to the uproar they changed things again, unannounced, to make third party clients partially work if their “security measures”, their excuse for all the disruption, are met. All their products have taken this same course. The first/early iTunes was incredible. Now it’s so restrictive I use Amazon Unlimited for my music and fight Apple trying apply unwanted updates to iTunes, which doesn’t always work. Their locking updated databases only makes all this all the more distasteful. AND the “Nickle and Diming”!! I lament the old Apple “User Experience” mantra. But have adapted, which is evolution for me and my abilities to deal with Apples severe new restrictions, greed and these questionable apps and services. BUT I have to thank Apple for opening doors and creating product concepts. Just thank goodness that others have jumped on so we have elsewhere to go. Since Jobs passed (sigh! ), the decision man Cook is treating Apple customers very bad indeed. Useful to know full icloud storage will prevent emails. Inaccurate to carp about 5G free plans as inadequate. I use icloud for email and syncing of several apps and have occasional phone backups for a total usage of ~0.3G (4.7G free). Hey John, that’s excellent that you’ve been able to make the 5 GB free tier work for you. Do you have any specific tricks or configurations that make the 5 GB plan work for you, particularly at such a small use? I assume you don’t have many videos and photos backing up? Anecdotally, I can say that most of my friends and family also long ago ran out of iCloud capacity at the free storage tier (which just happened to another person, which is when I discovered the aforementioned over quota bounce message, I literally have not seen one of those since the 1990s!). 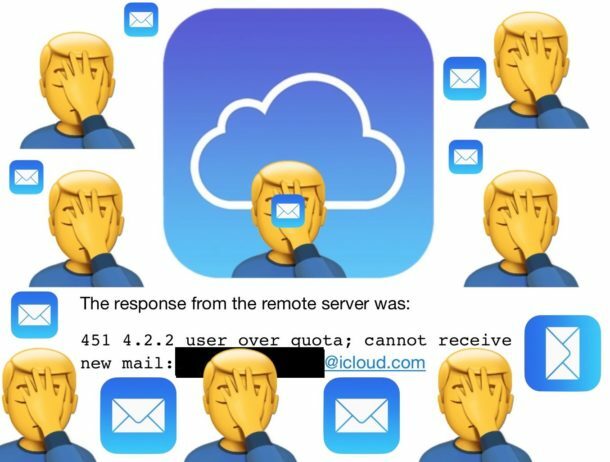 Even with the email quota issue I couldn’t convince this particular person to pay for more iCloud storage, they instead decided to just clear out all their iCloud data and punt on the storage squeeze. Anyway, always interesting to hear from other users about their own experience, so thanks for the comment! Important and daily used files stored in iCloud; others saved to a Time Capsule. iCloud is a non-specific backup “disk” in my opinion. I use iCloud as a common “platform” for file sharing between my Macs, iPads and iPhones for work. Although, this quate gate; so incredible in the 21st century. See that’s the secret, to “make due” with free 5gb iCloud plan you have to use the competitor services of Flickr and Google! So that is not a fair assessment. If you want to stay in the Apple ecosystem, iCloud is the way. You can not do that with the 5gb iCloud plan, you either pay for more, or you go outside Apple into the Google or Flickr systems. I just do not think that is good. Apple is pushing people to use competitor products. We already paid a lot for the iPhone, the iPad, the Mac, the services they depend on should be included in that price in my view. True, Carol, except Google’s default (free) limit is 15GB rather than Apple’s 5. And yes, I just recently sent email to a gmail address and received an over-quota message! If I understood iCloud at all I would maybe think about it, but as of now aside from backups I do not understand why it’s relevant or matters. I use Dropbox instead of iCloud Drive and it’s much more intuitive. I do use iCloud for backups but I hate paying extra for something that is free on android. I have the 50Gb option but I don’t remember when or why I got it. Maybe I set it up that way since it was cheap. I’m at about 9.5Gb, well over the free amount, mostly photos. I do get all sorts of invoices from Apple, mostly for music, and I don’t pay much attention to them. I never use the iCloud address, however. Two Gmail are accounts are quite enough. That’s because a Company in business, their main target is to make as much profits from consumers. Yeap Apple is highly profitable company and yet not willing to give free iCloud storage, that’s because “ consumers” are stupid in not asking. Stupid in continuously buying their products…..and so on. It’s “ consumers “ who have make them rich and arrogant. I’ve been an Apple user for almost 40 years, and seen the highs and lows of the company. Currently, Apple’s financials are as healthy as ever, but it’s not the same company that championed users and had users champion it in reverse. Perhaps it was inevitable, given the sheer size Apple has attained, and the fact that generations have passed, and those who not work at, if not run, the company only have some vague idea of what “The Apple Way” (like the HP Way) truly means. The situation with iCloud is ridiculous, given that it’s a per account amount, not per device. As mentioned above, how does that make for a good user experience? Especially for a premium, and premium-priced product? The fact that the incremental cost to upgrade to the first paid tier is trivial just proves that it’s not about the cost to Apple to provide 10x the storage, it’s about control, and user lock-in. And given the fact that it would foolish to operate without an iCloud backup, which is a key part of device troubleshooting, replacements, and upgrades, it’s a necessity, not a luxury to have adequate space, especially for users with multiple iOS devices who have invested thousands in Apple products. That’s something a storage-centric service like Dropbox or Box cannot duplicate, or make a seamless experience. Of the competition, Microsoft probably felt comfortable dropping its standard allocation to a matching 5GB after Apple continued to do so. But subscribe to Office, and it’s restored by generous magnitudes again. And any veteran Apple user should be aghast at using MS to justify Apple’s actions. The bottom line is that it’s now about the bottom line for Apple. Think Different was mostly a marketing campaign, but at least it had some truth. The irony is that if the 1984 commercial was remade today, it would be Apple users in the audience. There are a couple of errors in this article. I was one of those who was about to run out of storage about a year ago and I received regular notifications from Apple telling me about the impending consequences. I increased my storage to 50 Gb for 99c/month and have only used 30 Gb with three devices. You would not get free storage of 50 Gb from any other provider especially not with such services as photo stream, photo library and document and desktop storage automatically. what you get from Apple for a dollar is a lot more than you would get from any other provider and a lot simpler. When iCloud is full immediately when a back up of the iPhone or the iPad on the free plan, the notification states that iCloud is almost full, then that iCloud is full. There is no particular alert or awareness as to what that means other than that you need more iCloud space to backup, and it quickly asks you for a credit card purchase. Google offers free unlimited storage of photos for library and stream. Flickr offers 1 TB of free photo storage. So what you pay at Apple, like most other things you pay for with Apple, is a high price premium. Putting aside the price and competitors, it’s the user experience component that bugs me. To me if a customer product fails the obvious to that customer test, it is too complicated. Cloud storage should not be something on the customer mind, it should “just work” as Steve Jobs liked to say. Remember for most of Apple history, the Apple ecosystem was always the easiest to use. Is that still the case? I think you can quickly find many arguments where Apple has slipped. I’ve only used 2.02GB of my 5GB iCloud storage. It would probably be a lot less if I went through my very bloated inbox and deleted all those out of day emails that are no longer pertinent, but, I am not yet inclined to waste days of my time doing that. I back up locally, two hard-drives and a seperate Time Machine back-up, all my music and photos are on my iMac and therefore regularly backed-up, and basically my iCloud is for syncing between my devices, and storing some stuff in iDrive. I love the idea of the cloud, but not the amount of bandwidth that is used with the up and down loads of files, so I’m happy where I am. Cheers. Really… no one sees an over-quota message anymore? Are you kidding me?? It happens all the time with every single mail server out there. If it didn’t, what is the purpose for any quota to begin with? I’m not sure where the frustration lies. I think we should hold accountable the users that save 10s of thousands of spam emails for 10s of years because they’re too lazy to do some digital cleaning. Why should any company pay for this kind of laziness? YOU want to be lazy and feel that every single email is to important to delete? Then pony up and and pay for it. I’m sorry- I don’t think this is a case of “it just works” or the death of Steve Jobs marks the death of Apple culture. I’ve been with Apple since the early 80s, still have my .MAC address and work as a computer tech. I can tell you first hand that a common problem with email is that users do not ever empty their trash or do any kind of digital cleaning. This is the most misplaced frustration I’ve seen in a while. Apple is a price gouging company. Anything for more money, like lots of things its all being destroyed by endless greed! Time to switch to Linux and bin the cloud! Like some others, I usually have 4GB of storage or more free, that’s because I only use iCloud for Mail. Once a year I will archive my mail to a local backup and delete everything on iCloud. I also backup my files to hard-drives. They are cheap. If I want a ‘cloud’ backup, I’ll use one of my online providers, which I pay for. Apple’s iCloud prices were always too high for what they provided. I had that eVillage stuff years ago that was $100 a year as I recall. Anyway, Apple are counting on the sheer laziness of their users to not do their own local backups. I stopped using iCloud for other data around the time KeyChain files could no longer be synced. Then I though about it – why do I want to put a file, with all of my passwords on some other companies drives? Apple *might* have the best intentions regarding privacy (it sure it a great marketing piece) but given all the ‘dark’ UI design, especially on iOS, I frankly don’t trust them with my data. On that note, I do trust Apple more over google etc. there is absolutely no way I would keep files on their servers given how their business model is based on spying on users. Your data is like a diary. It is *private* and not the right of some un-ethical, bottom feeders to chew on. I have no problem with Apple charging for disk space, someone has to pay for the equipment and operation of the gear. I just don’t think that their prices are competitive, so I chose to use other methods. So whining because you’re too lazy to back up your own files just doesn’t seem like a valid point.